Can you customize cupcakes for me? Yes, we can customize the color of the baking liner, frosting, and sprinkles free of charge as long as we have your choices in stock. We can also pipe designs on top in buttercream by special order for $.50 upcharge per cupcake, see Decorated Cupcakes. Please note we don’t use fondant or gum paste which is necessary to mold 3D shapes. All of our piped designs are hand drawn with buttercream flat onto your cupcakes by our experienced cake artists. Can you put a logo on a top of a cupcake? We can only do so if you are the copyright owner or have express permission from the owner. Please not we do not offer edible screen printing technology, and all of our designs are piped by hand with buttercream. What do you decorate your cupcakes with? We hand pipe all our decor with buttercream frosting, and do not work with fondant or gum paste. All toppers must be purchased and provided by the client. We do have birthday candles available to purchase at our Cathedral Square bakery. Can you color the frosting? Yes, we can tint frosting, we prefer pastel or medium colors. Adding more dye to the frosting affects the flavor and makes it more susceptible to staining teeth and clothing. We suggest white, chocolate, or pastel colored base buttercream, and saving darker colors for details or accents. Can you color the cake batter? Sorry, we do not dye our cake batters, other than red velvet. Do you make cupcake cakes? We do not frost over multiple cupcakes to make them look like one cake, but you are more than welcome to purchase cupcakes and arrange them into a shape at home. How much can you write on a cupcake? The most we can fit on the top of a standard or jumbo cupcake are numbers, single letters, monograms, or words up to 6 letters long. We do not offer piped designs on mini cupcakes or cheesecake cupcakes. How much does a custom decoration cost? We charge and additional $.50 for hand piped decor, see Decorated Cupcakes for examples. Can I get a filling in my cupcakes? 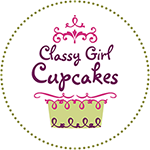 We charge an additional $.50 per cupcake to add a custom filling to standard sized cupcakes. We cannot fill mini cupcakes or cheesecake cupcakes. Custom fillings include buttercream, fruit jams, pastry cream (custard), mousse, whipped cream, and cheesecake filling in any flavor of our cheesecake cupcakes.